Mop to it. 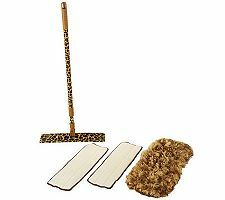 With its fresh Leopard Animal print, this extendable mop set awakens your household cleaning routine. The fashionable and functional set includes three commercial-style, oversized microfiber pads that easily pick up dust and dirt from your floors. Best of all, they can be used to clean most surfaces in your home with just water–no chemicals needed. From Joe Campanelli.